If you’re just starting out or you’re an SEO guru you definitely need to look at the following plugins for your WordPress blog. These plugins and widgets will help you with your SEO, help to combat spam and give you the upper hand above other similar websites. Just go to Plugins > Add New and enter in the plugins name exactly as listed below. Akismet is a well known plugin for combating comment spam and especially the annoying trackback spam. You’ll still have comments to approve but it will cut down significantly on all the spammy comments like “This site are awesome. Buy my product?”,“ The thing you wrote on this specific page has moved me”and more horrible spammy comments not worth your time! SEO Yoast is a user friendly SEO plugin that helps you optimise your site with custom meta data tabs for each page and post as well as giving you sections to paste in your Google Analytics code and sitemap URL without struggling with the template or any kind of coding. This is a definite first as it helps you focus on your keywords for each page and post so that you will rank for your keywords (which gives you more traffic). Google hates broken links on your site, but with this great plugin you’ll be notified, via email, of any broken links detected. It scans your site regularly so you’ll be up to date with any links going down. If you haven’t added your site to Webmaster tools you should do that know! It’s great for indexation (indexing lets Google know it should list your posts/pages) and any other technical statistics your site needs. Now back to the sitemap! After creating your sitemap with this plugin you can add the url to Webmaster Tools and get indexed,huzzah! A great widget which makes a list of your most popular pages. 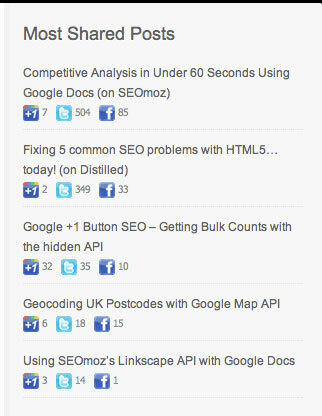 A great way to direct traffic to other posts on your website. It actually measures which articles has the highest tweets, facebook shares and +1s. If you haven’t gone into social platforms yet you should defiantly try pinterest (and Twitter for that matter). With this widget you can set how many images to display of what you’re currently pinning on Pinterest. Works great if you have a very visually orientated site. Facebook is a massive social media platform and millions (if not billions) are using it. With this plugin you can make it easier for your users to register to your site with the click of a button. Jumping on the social media wagon again! Simply because it’s the way to go and grow your community. With this widget you’ll be able to showcase all of your important social media platforms in this stylish box. This plugin can distinguish if your visitor is using a tablet or phone and can give them the correct display to help them surf your site easily and with comfort. If the first time visitors gets a good impression of your blog/site, you can expect them to come back again. If you need to redirect pages and posts this is a simplistic and very effective plug in to do so. If you have any other plugins/widgets that you would like to add, drop your suggestions in the comment box below! Tim enjoys helping people with SEO, Social Media and PPC advice and tips, nothing beats on hand experience, start that website today!